As more and more focus comes to the blue line, the conversation inevitably shifts from those being scratched and those who fans believe should be scratched, to those that seem to be skirting under the radar. For the Rangers, there is only one player that hasn’t really been talked about in quite some time, and that is Kevin Shattenkirk. Shattenkirk is not immune to being a healthy scratch, he made headlines when he was a healthy scratch within the first two weeks of the season. But Shatty has flown under the radar since then. The common narrative is that Shatty puts up points, drives possession, and is otherwise the best Rangers defenseman. It’s certainly something I subscribe to. However this year Shatty is not scoring. His 1-7-8 line thus far this year isn’t cutting it. It’s easy to point to the fact that he’s not on PP1 anymore, but there’s also a reason why he’s not on PP1 anymore. That reason isn’t something we know for sure, but he started the season there, and now he isn’t. So the lack of scoring being tied to lack of PP time is justified, but also earned. Since the argument is that Shatty drives offense, even if it doesn’t necessarily show up on the scoresheet, let’s look at how Shatty’s peripheral stats are. First things first, Shatty drives shots. We know this. Over the course of the season, he’s the only Rangers defenseman above the median “good” line. Since Shatty plays first pairing minutes, the next logical step is to see which teammates he’s on the ice with, and who he’s matched up against. If I’m reading this right, and assuming that the more minutes played means the higher quality of teammate/opponent, then Shatty generally doesn’t get the best teammates, at least in terms of TOI. Only two defensemen (McQuaid, Claesson) get weaker forwards. None get worse defensemen. Again, in terms of ice time. As for opposition quality, Shattenkirk again doesn’t necessarily face the best quality forwards, as McQuaid and Claesson are again the only two who face weaker forwards. Claesson is the only player who faces weaker defense competition as well. One last time, this is based on ice time. So on one hand, we have Shatty as the top offensive driver on the blue line, in terms of shot attempts on the ice. He does this with less than quality teammates. When you consider some of the defensemen the Rangers trot out there, it’s a feat. That said, he doesn’t face the best competition. He’s also getting mostly offensive zone starts, for what it’s worth. Raw shot totals aren’t really the best barometer for measuring a player nowadays. CF% is giving way to SCF% and xGF%. This makes sense, of course. You want to have a measure of quality in your analysis, and SCF% and xGF% give you that. In terms of season totals, Shatty is actually third among NYR defensemen in xGF% at 51.21 (Claesson, and believe it or not, McQuaid). When looking at his fellow NYR defensemen, Shatty is 2nd in relative xGF% at 3.33 (Claesson). Shatty is also third in SCF% (49.84). Again third to both Claesson and McQuaid. Interesting, but Shatty is still top-three on the team when you start adding quality to the mix. You can also assume that he will be tops in these categories once the season plays out in full. One last aspect I want to look at is game-by-game analysis. I can’t find a game-by-game review of Shatty’s SCF%, but I can for xGF%. Without listing them all, Shatty had a negative relative xGF% in 13 games thus far, and only 11 have a positive relative xGF%. That leads me to believe that Shatty’s good games are significantly pulling up his worse games, as he’s only a net positive –comparatively to his teammates– a little less than half the time. For non-relative xGF%, he’s below 50% xGF% in 15 of 24 games. Of his nine above 50%, seven are above 70%, so his good games are great. What does all this mean? To me, it means that when Shatty is on, he’s one of the best defensemen in the league. However he’s been wildly inconsistent, with more bad games than good. His great games are holding up his season-long numbers, while his game-by-game is a little rough to look at. Hopefully this balances out by the end of the year. Visuals from hockeyviz.com. SCF% stats per corsica.hockey. All other stats from offsidereview.com. "Kevin Shattenkirk and the real life case of being a Monet", 1 out of 5 based on 7 ratings. Based on this statistical analysis, conventional stats, and the eye test, it’s pretty clear that Shatty is not hurting the team, although he doesn’t perform up to the expectations many had of him. His saving grace is his reasonable contract. So, what now? Bench him, trade him, play him with better partners, keep going as is…? I say it doesn’t really matter and let him be. He’s the least of our concerns. He was a second pair d-man on a very good team with the baggage of high expectations. He came here at a discount and is now arguably the best d-man on a team that is mediocre at best. As Skjei, Pionk and DeAngelo continue to improve, Shatty may become a weak link, but right now he’s just fine. Really nothing to do or see here with Shatty. Hopefully the Rangers get a true top pair D man and Shatty will improve from there, as he’s not the guy teams rely on exclusively. At this point, Skjei is more the D man at risk of being moved (traded), IMO. Pionk and ADA have been in different realms of becoming better hockey player’s. Skjei has been on the downside since the IIHF of 2017 and his game hasn’t improved ever since he’s been exposed to tougher matchup. The fact that he could have gotten more elsewhere does not make his contract reasonable. Given his salary, not hurting the team is simply not good enough. There are better defensemen who make less money – Marc Staal for example. Staal may be in slightly over his head as a first pair D, but Shatty simply can’t play first pair D. And if the Shattenkirk contract is less reasonable than the Staal contract, it is hard to argue that it is a bargain. Maybe things will change, but for now the contract is an albatross. Shattenkirk was signed a power play specialist who would suffice as a second pair defenseman. If he is not first unit power play, he is not worth the money. Agree about the power play 100%. Not sure what you are trying to say about Staal, and I’m not a Staal hater, but everything about him other than his reach is worse than Shattenkirk, including his contract, and I don’t think it’s even close. I love Shatty. He’s an Irishman from NY. Even if it’s a slightly different NY than mine (NYS/NYC). I do think the new coach and system are going to slow his production from what is expected of him. He’s not a top 10 or even 20 defenseman in the NHL. However, he’s a solid top 4 rearguard that can drive positive possession for the Rangers. Something they really haven’t had in a while. It’s been rare in the age of Metrics the Rangers had a defenseman at or above 50% in top possession stats. I think Shatty is going to be that guy. Give him time. He is also coming off major knee surgery. Often times it takes a full season for a player to come back to full speed following surgery. Correct me if I’m wrong but he had a meniscus tear, which isn’t serious at all. I had that on both of my knees long before they were replaced years ago. As for Shatty as a defense man, he is a defensive liability. Everyone is down on ADA, and Pionk, for their defensive play but Shatty gets a free ride because he signed with us at a reduced rate. The guy can’t play a lick of defense, and when on the ice, and not putting up points, he’s a waste of time. Please let’s not make excuses for his play, we don’t for the rest of the d-corp!!!!!! My thoughts about the meniscus tear as well. I had surgery for that (age 51) and a month later was better than I had been for a long time. I was very surprised he did not play at the end of last season. I am not a physician, but I have represented clients with meniscus tears so I have studied up on the condition to some extent. There are at least six different types of tears and they occur at different locations, leading to very different outcomes. Some tears can be so mild as to practically heal without surgical intervention, while others are debilitating. Importantly, Meniscus repair surgery, which is likely what Shatty had because the rigors of an athlete demand his meniscus be able to withstand a lot of stress, requires more complex surgical procedures and post-surgical rehabilitation. Assuming I am correct, that would explain his longer recovery time. Sorry Peter but I had a bucket handle tear of the medial meniscus, and went back to work within three days, with little effect after some two weeks. Shatty milked that, and or the team said sit it out my man, your stinking up the place with your defensive play!!!!!!!!!!! If they only removed part of your meniscus with arthroscopic surgery, then sure, you recover quickly. I don’t know whether he had it, but if they did full reconstructive surgery on this meniscus then that is a much more complex procedure Walt, and requires physical rehabilitation post operatively. I suspect that is what he had (but I certainly don’t know!) Would be interesting to know because yes, he was out a long time. Again, the procedure I had was a bucket handle tear, which basically they remove the whole of the medial meniscus. They call it that because that’s what it looks like, and it pulls out from the joint. I was in my 40’s at the time, and again went back to work within three days, with no major side effects. Some 20 years later, due to no meniscus to cushion the knee, I had to have a complete replacement!!!!!! I suspect that he may have had more than that to take this long to heal??????? Picking on one defenseman when we have 7 underachievers (to me) doesn”t make sense. None of our defenseman are stellar and now we are comparing the stats of all the inferior defenseman to see who is worst? Until we pick-up a top pair of defenseman, let these poor guys rotate until the trade deadline comes. Thanks for this article. It’s really interesting what you can do with xGF% when you delve deep into it. Do you think xGF% is a good enough stat that it can drive a “Moneyball” revolution the way OBP and OPS did in baseball? xGF% is not that type of stat. Minds better than mine are trying to get to a WAR type stat, but it’s exceedingly difficult, given the information that is available to the general public. How can players underachieve if they’re not that good to begin with? I’d say only 2 of NYR’s 7 defensemen could possibly be considered as underachievers so far, based on previous NHL production, and that’d be Skjei and Shattenkirk. Brendan Smith is not good, Staal is in freefalling decline (and arguably playing better than last year), while the rest of the corps is made up of relatively unproven players. How is an article that focuses on one player’s year to date picking on someone? Most people would call this technique analysis, not picking on someone. Hi Dave, lazy question but is there a way to see older articles on the new layout? I’m only seeing posts back to 11/21 on the front page, and no link to scroll back further. thanks! There is an option for it, but it was displaying duplicate posts. Trying to work through that. Clueless, what a great movie. Shatty has always been an offensive minded defenseman. Anyone who thought he was a shutdown player was not paying attention. Paired with the right guy he will drive offense. That is what the Rangers are paying him to do. Whatever his faults in the defensive zone, he is a talented passer and he consistently gets his shots through to the net. I think he is a net plus for the team. If he’s so offensive minded, why is Pionk, a relative rookie, the best at leading the charge up the ice? Shatty is slow, and a figure skating overrated player, who gives the puck up way too easily when pressured. Disclaimer: I admit to being less than fluent understanding statistics……but am I correct that the table above (that shows the Jersey # and Shots -with/without), indicate that Marc Staal is the leader? I suppose it could be just a result of being on Top D-Line…..
Like I said not too fluent….looks like Brady is the Leader. Love all the down votes. Although I am not exactly sure what they are voting down on? Is my interpretation of the table wrong? It would be a great option if the website could show who is voting down/up……I realize the website is a labor of love so it isn’t a criticism. But anonymity reduces the value of the votes to my why of thinking…..
On the importance of shot totals: A few days ago, I looked at shots for and against, goals for and against. You might think that if a team took more shots than they gave up, they would also score more goals than they gave up, while if they gave up more shots, they would also give up more goals. That guess turns out to be right for 17 of the 31 teams and wrong for the other team. Put another way, if you want to know whether a team outscores its opponents on average, knowing whether or not they outshot their opponents is a tiny bit better than flipping a coin. In case anyone needs a visual to explain the clueless quote, watch ferris bueller’s day off to see the example of a far away and up close Monet. Not sure he is even playing like a half-a-2 at this point. maybe he can mentor our younger guys? You know that we all for the most part like Shatty’s offensive game, when on, but his defensive game is terrible. Last year even Barry Trotz commented on it, but because he is wearing our jersey, people wear blinders, and get upset when it’s brought to other’s attention, as indicated by all the thumbs down by anyone who made any kind of a possible negative statement. True fans, misguided but true fans, and I laugh at it some times!!!!!!!!! i agree, most people drink the Ranger Management Kool-Aid, at least Quinn so far, has no problem with sitting underachievers, regardless of contract (though Staal has earned some sitting time too), Skjei and Shatty contracts are part of the reason why we will be saddled with average or (below) D-men, with inflated contracts, while the guys like Pionk emerge. If AV was still here, Shatty and Staal and Skjei would get all the ice time. I think Pionk, is a better and cheaper version of what Shatty was brought here to do. 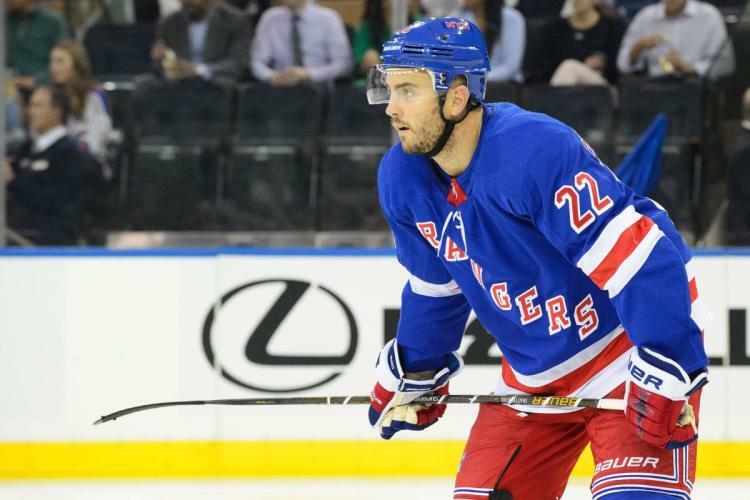 When the Rangers originally sighed Kevin Shattenkirk in the summer of 2017 it was as an addition to what management and most fans believed to be a contending team. It was hailed by most people as a great signing. When the season started it was very apparent that we were not contenders. Heck we weren’t even pretenders. Had management recognized this fact earlier then they wouldn’t have even signed him and would’ve begun the process of rebuilding earlier. As for his injury every person heals differently. Maybe the public announcement of a “Meniscus” injury was B.S. Maybe it was something worse. This is the NHL after all. Not exactly the most transparent organization when it comes to a players injury status. I definitely agree having a reliable partner wouldn’t hurt but we are in a rebuild and there aren’t many top D-men available so we have to work with what we have. For all you statsaholics. STOP. It’s not complicated. I’ve been Playing & following Hockey for almost 50 years. You guys make it way to complicated. I believe the EYE test and Plus/minus. How do you account that Pionk (who arguably has been the best D-man all season) is MINUS-4 worst D-man on the team Yet for all you haters Staal is PLUS 4 Second only to DeA’s PLUS 6. Getting back to the original topic Shattenkirk is an average NHL Defenseman who was brought in to help the Rangers contend for the cup. Unfortunatly for both him and the team the situation changed rapidly and both are stuck with each other.